Your closet has seen its fair share of trends come and go. Some trends graduate into wardrobe essentials, but the basics—that perfectly worn-in white tee, your favorite jeans, and go-to black pumps—are forever. You can rest assured these key pieces will never go out of style or lose their street-chic appeal. Simply put, they’re the building blocks of a perfect wardrobe. Even if you already have a majority of the products listed ahead, chances are a few of them may need a refresh. Because if there’s anything we know about basic wardrobe essentials, it’s that you will wear them on repeat—as you should. So whether you’re looking to start over or simply wish to update an old favorite, shop our picks below for the basics every wardrobe needs. 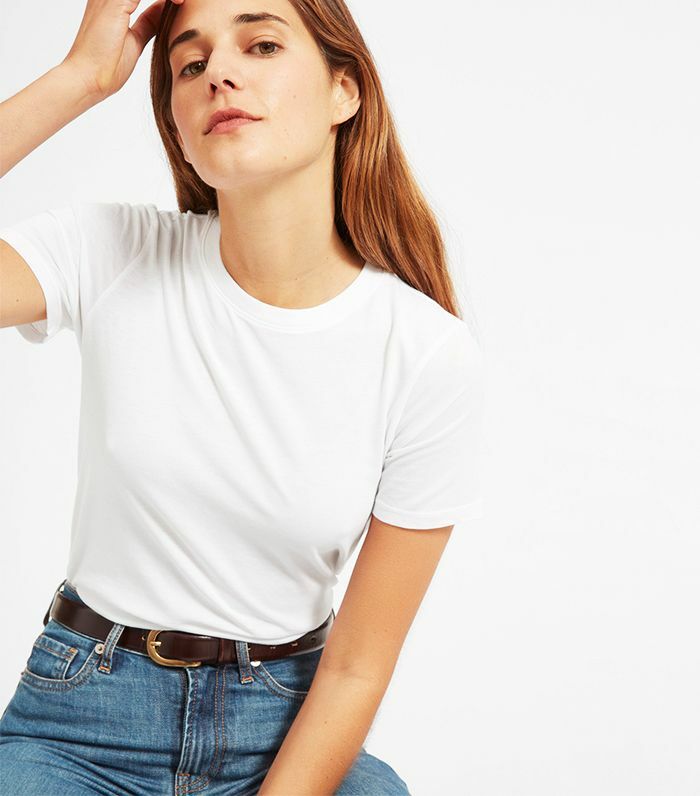 It doesn’t get any more classic than a white T-shirt. The best styles are super soft and have a relaxed, lived-in fit. While a crewneck cut is a no-brainer, a V-neck style works perfectly as a canvas for layering necklaces. During the winter-to-spring transition, a lightweight sweater can become your best friend. Layer one over a collared blouse during the week and pair it with relaxed jeans over the weekend. The fit and wash of skinny jeans make all the difference. Go for a slightly high-rise style for length and stick to a true-blue wash that will go with everything. When it comes to shoes, black pumps are perhaps the most reliable and versatile option out there. Sophisticated and sultry all at once, they’re perfectly suited to fit almost any outfit and occasion. When you feel like your tote bag is too big but your clutch is too small, a medium-size crossbody bag is a perfect solution. In an attention-grabbing color, this portable handbag packs a (stylish) punch. This is the wardrobe staple that can easily add a bit of polish to both your work and off-duty uniforms. Pencil skirts are no longer reserved for the office. We love pairing the piece with a silk cami or T-shirt for drinks after work. Go ahead and splurge on this outerwear essential. Trust us—the investment will be worth it. A leather jacket can be worn year-round and only gets better with age. An oversize watch adds interest to pared-down pieces at the office and can double as a bracelet when layered with additional jewelry. This is a style of dress that stands the test of time. Plus, the silhouette is universally flattering. When you need a break from your heels, neutral-colored flats serve as the ideal substitute. Straddling the line between dressy and casual, this functional footwear style pairs perfectly with tailored trousers or a midi dress. Sleek frames are inherently cool and offer a polished touch—no matter the season. Ankle boots have become wardrobe staples ever since Isabel Marant released the ever-so-infamous Dicker boots. The good news: There’s a pair of ankle boots for just about every style out there. What timeless piece would you add to our list? This post was published at an earlier date and has been updated by Lauren Eggertsen.